Bouillabaisse is a traditional Provençal fish stew originating from the port city of Marseille. 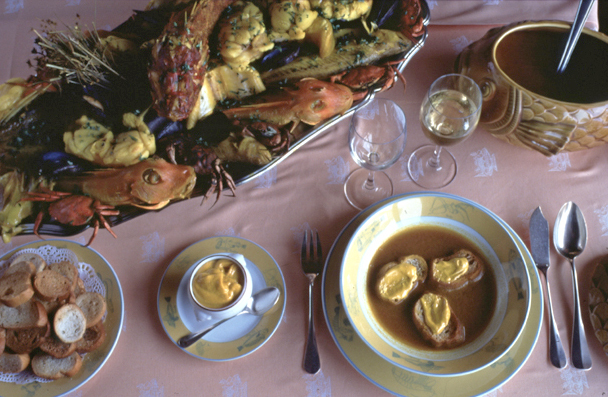 Left: An authentic bouillabaisse from Marseille, The fish and shellfish are served on one platter, the broth is served in a bowl with rounds of bread spread with rouille. The name bouillabaisse comes from the method of the preparation - the ingredients are not added all at once. The broth is first boiled (bouillir) then the different kinds of fish are added one by one, and each time the broth comes to a boil, the heat is lowered (abaisser). The dish known today as bouillabaisse was created by Marseille fishermen who wanted to make a meal when they returned to port. Rather than using the more expensive fish, they cooked the common rockfish and shellfish that they pulled up with their nets and lines, usually fish that were too bony to serve in restaurants, cooking them in a cauldron of sea water on a wood fire and seasoning them with garlic and fennel. Tomatoes were added to the recipe in the 17th century, after their introduction from America. In the 19th century, as Marseille became more prosperous, restaurants and hotels began to serve bouillabaisse to upper-class patrons. The recipe of bouillabaisse became more refined, with the substitution of fish stock for boiling water, and the addition of saffron. Bouillabaisse spread from Marseille to Paris, and then gradually around the world, adapted to local ingredients and tastes. Bouillabaisse is a fish soup containing various kinds of cooked fish and shellfish and vegetables, flavored with a variety of herbs and spices such as garlic, orange peel, basil, bay leaf, fennel and saffron. There are at least three kinds of fish in a traditional bouillabaisse, typically scorpionfish (fr: rascasse); sea robin (fr: grondin); and European conger (fr: congre); and it can also include gilt-head bream (fr: dorade); turbot; monkfish (fr: lotte or baudroie); mullet; or silver hake (fr: merlan). It also usually includes shellfish and other seafood such as sea urchins (fr: oursins), mussels (fr: moules); small crabs (fr: etrilles); spider crab (fr: araignées de mer) or octopus. More expensive versions may add langoustine. Vegetables such as leeks, onions, tomatoes, celery and potatoes are simmered together with the broth and served with the fish. The broth is traditionally served with a rouille, a mayonnaise made of olive oil, garlic, saffron and cayenne pepper on grilled slices of bread. What makes a bouillabaisse different from other fish soups is the selection of Provencal herbs and spices in the broth, the use of bony local Mediterranean fish, and the method of serving. In Marseille, the broth is served first in a bowl containing the bread and rouille, with the seafood and vegetables served separately in another bowl or on a platter. Bouillabaisse is rarely made for fewer than ten persons; the more people who share the meal, and the more different fish that are included, the better the bouillabaisse. 1. Clean and scale the fish and wash them, if possible in sea water. Cut them into large slices, leaving the bones. Wash the octopus and cut into pieces. 2. Put the olive oil in a large casserole. Add the onions, cleaned and sliced; 6 cloves of garlic, crushed; the pieces of octopus, and the tomatoes peeled and quartered, without seeds. Brown at low heat, turning gently for five minutes, for the oil to take in the flavors. 3. Add the sliced fish, beginning with the thickest to the smallest. Cover with boiling water, and add the salt and the pepper, the fennel, the bouquet garni and the saffron. Boil at a low heat, stirring from time to time so the fish doesn't stick to the casserole. Correct the seasoning. The bouillabaisse is cooked when the juice of the cooking is well blended with the oil and the water. (about twenty minutes). 4. Prepare the rouille: Remove the stem of the garlic, crush the cloves into a fine paste with a pestle in a mortar. Add the egg yolk and the saffron, then blend in the olive oil little by little to make a mayonnaise, stirring it with the pestle. 5. Cook the potatoes, peeled and boiled and cut into large slices, in salted water for 15 to 20 minutes. Open the sea urchins with a pair of scissors and remove the Corail with a small spoon. 6. Arrange the fish on a platter. Add the corail of the sea urchins into the broth and stir. Serve the bouillon very hot with the rouille in bowls over thick slices of bread rubbed with garlic. Then serve the fish and the potatoes on a separate platter.